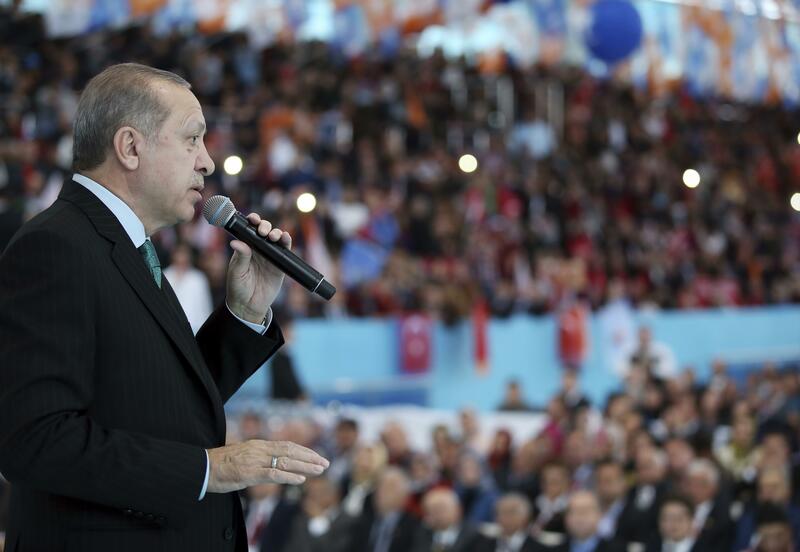 Sun., Dec. 17, 2017, 8:32 a.m.
President Recep Tayyip Erdogan told a rally in the central province of Karaman his country would not allow “terror nests” near its border, referring to areas held by the People’s Protection Units or YPG in northern Syria. Turkey considers the YPG an extension of a Kurdish insurgency within its own borders, and launched an operation in August 2016 to clear part of its border of their and the Islamic State group’s presence. Erdogan announced an expanded list of areas to be cleared. “We will clean Afrin of terrorists, we will clean Manbij of terrorists. We will clean Tel Abyad, Ras al-Ayn and Qamishli of terrorists,” he said. Erdogan has frequently expressed frustration with the Syrian Kurdish militant group’s presence at Turkey’s border. But it’s rare that he mentions Qamishli, a town further east controlled by both the Syrian Kurds and Syrian President Bashar Assad’s government. Last month, Turkey’s foreign minister said President Donald Trump promised to stop arming the militant group but the Pentagon said it was reviewing the process, stopping short of announcing a halt to weapons transfers. Published: Dec. 17, 2017, 8:32 a.m.